I would like to recommend a couple to add to your list. These are both amazing books that hit on a bunch of different roles of the pastor. Matt, I’ve added Derek and Alistair’s book to the list. I’m not sure how I missed that one off in the first place. The other one I’ll be sure to take a look at. Another great preaching book that is fairly new is Dennis Johnson’s Him We Proclaim: Preaching Christ from all the Scriptures. It’s a combination of hermeneutics and sermon construction and delivery. A very good resource and should become a standard in the near future. Thanks for your list, there are many on it that I still lack. Spirit-empowered Preaching by Arturo Azurdia. It is very passionate, biblical, and reformed. I know you’d enjoy it and be edified and equipped by it. Look forward to meeting you there..! 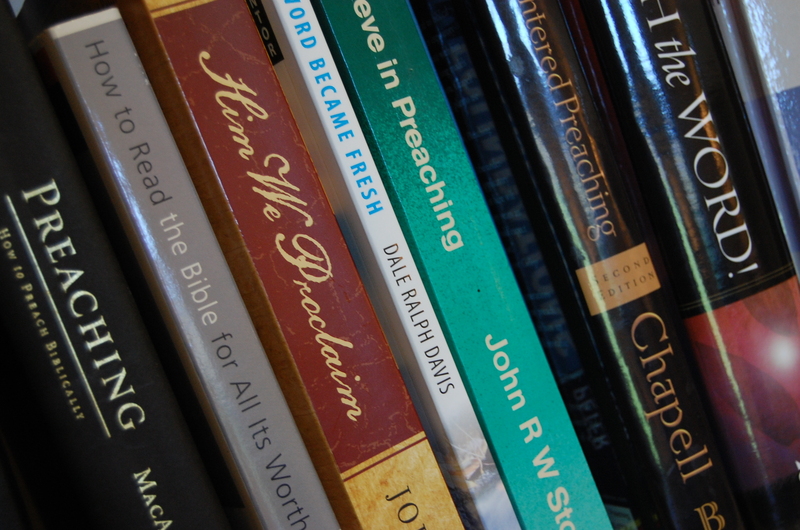 Spirit Empowered Preaching is one I’ve never read, yet I’ve heard it recommended time and again. Perhaps I’ll finally need to get round to taking a look. Colin, thanks for the post and for the site. It’s been very helpful to a person felt called to Pastor. Another book that I would recommend is Tony Merida’s book Faithful Preaching. It is a really good book and has helped me.